When I tell people that I am an artist, I often get the reply, “I can’t even draw a straight line.” For some reason, people feel the need to share their perceived artistic incompetence with me when I tell them that I am an artist by profession. It is curious to me. I don’t tell doctors that I have no medical background when I meet them, nor do I tell computer programmers, teachers, engineers, plumbers, or other professionals that I lack skill in their discipline. So why do people feel the need to disqualify their artistic bonafides to me? Perhaps it is because we all create art as children, and as we grow older, only the ones who demonstrate skill and passion for art stick with it. Regardless of the reason, I have found that many people want to create art, despite having what they view as limited ability. They dismiss the urge, however, because they fear that they will fail to meet their own, or other’s, expectations. Young children have fewer expectations, so when they create, they explore, engage and enjoy the process. The process of creating is full of wonder for children, and despite their struggles to make what they consider to be a worthy art object, they are much more free and unencumbered in the process. When I teach art classes for adults, I do not teach mastery or technical skill. I teach wonder and expression. 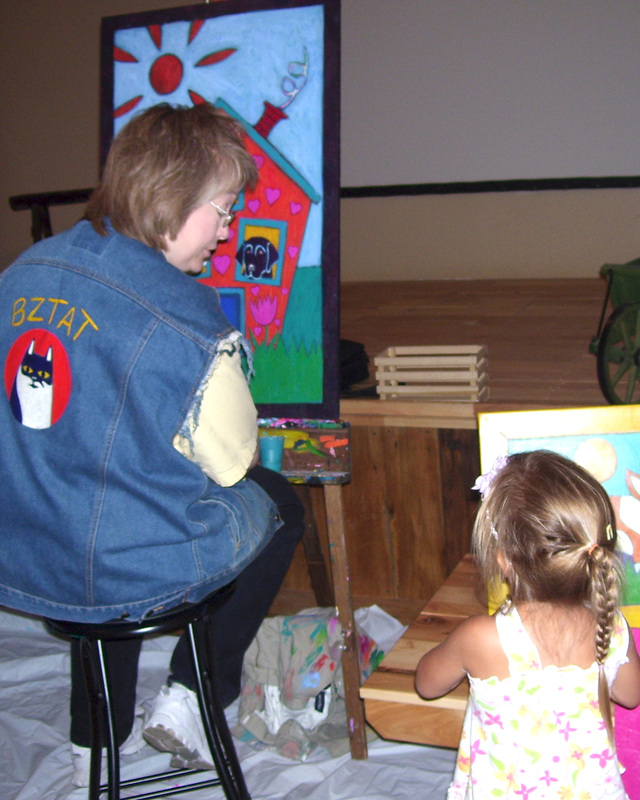 My goal as an art teacher for adults is to help them return to that childhood wonder in the creative process so that they are free to engage in art as an enriching activity. Certainly, I guide them through the process of creating an image using materials and artistic techniques. I give them instructions on specific techniques, and I guide them in the characteristics of artistic media. But more than anything, I give them encouragement, and I help them broaden their expectations so that they do not box themselves into too few acceptable outcomes. I teach my adult students to return to their childhood wonder so that they can, again, explore, engage and enjoy the process. A week from today, I will be teaching my first pet portrait painting class for adults. I have taught this class to middle school students in the past, but never adults. The first step for the class is convincing people that they can do it. I was talking to a prospective student the other night who shared her misgivings with me about her ability to accomplish anything in the class. “I want to do your class next weekend, but I don’t think I can,” she said. “How come?” I asked, thinking she had some other commitment. “Because I don’t think I am a good enough painter,” she replied. She was surprised at my response, but still unsure. I hope she comes to the class. She will surprise herself at what she can do. I am certain of it. Creating great art is not about drawing straight lines. Truth be told, I can’t draw a straight line either. I have to use a ruler every time I draw one! Creating great art is about exploring, engaging and enjoying the process of creation. Want to see? There’s still time to sign up for my Art Mini-Retreat for next Saturday (10/18/14). And stay tuned if you are too far away to come to the studio. I will be offering some online classes in the future. Are arts districts good for artists?